Aam Ka Achaar. What are we talking about, are you asking me right now? Guys, I thinks pictures have already spoken and connected you to this Mango Pickle, a Punjabi style achaar or pickle. Mouthwatering and you are salivating right now right? My favourite. Any kinda of pickle or chutney, or even sambal dip for the matter (Tamatar ki Chutney, Penang Acar & Sambal Terasi). Aam ka Achaar obviously showcases mango as the core ingredient and mango by far, I think a favourite among many of us (Prawn Mango Curry, Thai Mango Sticky Rice & Mango Mocktail)? 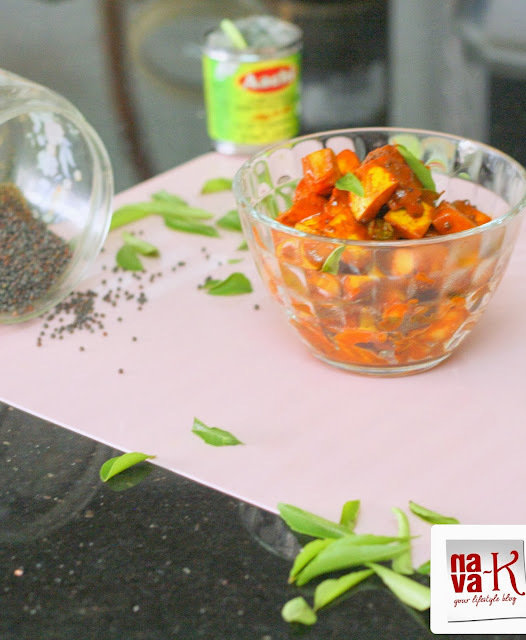 This Punjabi style achaar is just plain and simple, but trust me, a perfect fab fit as a condiment for our rice meals (Vegetable Achar & Salted Fish Pickle), and you basically need a couple of ingredients listed below, unless you want to take it to the sky level by adding whatever other ingredients. Aam ka Achaar nava-k's style by the way is different (Indian Mango Chutney), or better for me to say as unique because I did it my way instead of the conventional method of following others. Aam ka Achaar? The burst of sour spicy notes in one. 1 semi/unripe mango - remove seed and cubed. In heated oil, splatter mustard seeds. Add chilli and turmeric powder. Quickly stir and add all the other ingredients. Give a fast stir and remove, cool down, pack in a bottle and store in fridge. Now I have to find unripe mango :) Interesting dish I never thought mango seasoned with these spices,looks so good, Nava ! can't wait to try. and yes grandma/mother's recipes are the best and forever! This pickled mango is very delicious if eat it with fried sardines or ikan kembung. I had it for dinner just now. A friend gave me pickled mango and it really yummy to go with fried fish. However my pickled mango is just plain with some vinegar, sugar and chili padi. Now a days I keep myself away from pickles..but your pickles have again tempted me..nice one..
interesting! Nava, I have never tried this before! I love "spicy" and "pickle" in one sentence, really tongue tickling pickle. Love the mango pickles.We go by something similar except the sugar. 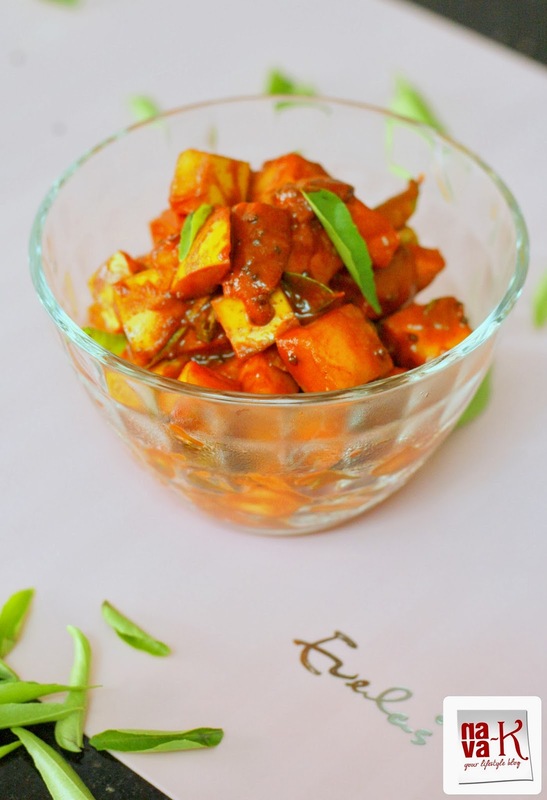 I used to like calling myself the 'Home Economist' :) Recipe looks good, albeit I've never tried pickled mangoes before but it sounds like a fusion of spicy, sour and sweet flavors from the recipe. Irresistible, mouthwatering pickle.. Love to have with curd rice.. The grannies certainly had the practical culinary wisdom and knew the nuances so well. I have never tried mango pickle of this version. The curry leaves addition has certainly tempted me into trying it...only that I need to wait for the 'unripe mango' season! Oh well this is too enticing, can't wait for the next summer to have a little now....looks heavenly! Oh my God, you get pickle mangoes around this time of the year. I am salivating Nava, this is the only pickle that I love but I never tried to make it, I always got it from my mother and after her death its my sister who sends me. Your recipe looks so tempting. I would especially like it right this moment . wonderful mouth watering pickles .Lovely clicks. This is super tempting Pickle . Nava your photograph makes me drool .. Delicious and flavorful pickle, perfect with some curd rice. Who doesn't like a pickle and making it at home makes it so special. Familly recipes are always the best! Your's looks delicious and I love how the reciple is so doable. I love mangos! Growing up in Brazil we had some mango trees in our backyard, so good to climb on them and had a fruit right on the spot. Nonetheless, I've never had a mango pickle, and I think it's time to try it, the recipe seems delicious. I could feel the tangy taste of mangoes...great looks.. I love mango never thought in trying ot with a bit spice great recipe. 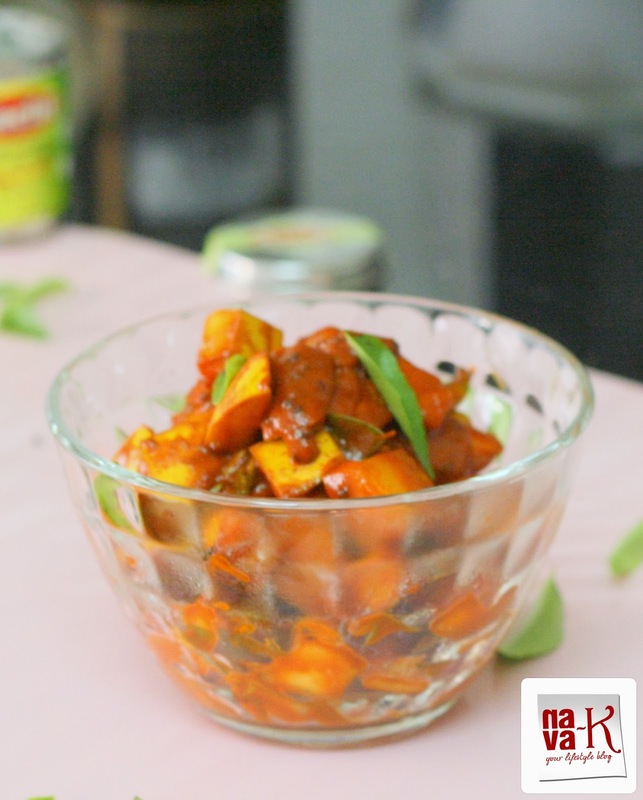 Oh, summer is here and your post of this 'cut mango' pickle(that's how we call it ), is a proof to that!! I am still to get raw mango for pickling here, but am I am sure to make this pickle very soon. All I need is curd rice to enjoy this pickle.